When Chicago’s Uptown Theater opened its doors in the summer of 1925, its owners boasted that it was the largest and most sumptuous movie palace in the country. It had opulent décor and intricate, monumental chandeliers (at the time called “electroliers”) created by Chicago’s Victor S. Pearlman & Co. But when the Uptown Theater hit on hard times in the 1980s, the once splendorous movie palace began to deteriorate, and looters regularly broke in to steal sellable ornaments and fixtures. In the 1990s, Curt Mangel was a mechanical engineer who worked on the residential properties owned by the proprietors of the Uptown. But Mangel, like a number of other concerned volunteers, convinced his bosses to let him tend to the Uptown. Mangel’s concern extended beyond the mechanical neglect of the old movie palace. Time was taking its toll on the grand building and thieves were doing extensive damage. One-of-a-kind lighting fixtures were disappearing. 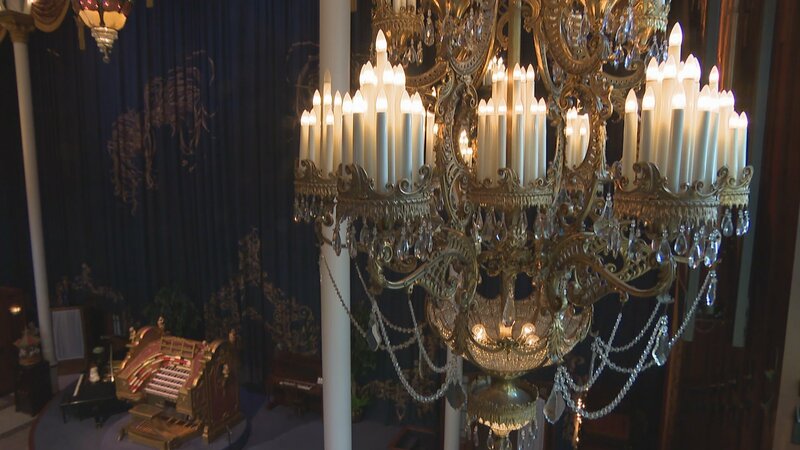 “The people who removed the large sections of smaller chandeliers did it very quickly and very professionally and got an awful lot done in one night,” says Mangel. Some of the fixtures were recovered from local resale shops but there were fears that the largest and most elaborate of the “electroliers” could be targeted by thieves. Mangel wanted to save them. By that time, Mangel had gone to work as an engineer at the vast Sanfillipo estate in Barrington Hills. Jasper Sanfillipo made his fortune as a nut magnate, having invented a proprietary nut-shelling process and later owning several nut companies. But one of Sanfillipo’s passions is collecting mechanical musical instruments from around the turn of the 20th century. In the magnificent mansion that houses his impressive collection, Sanfilippo also built a theater organ concert hall featuring artifacts and fixtures saved from razed movie palaces across the country. When Mangel asked his new boss if he could store the Uptown’s chandeliers at the estate, Sanfilippo agreed and went a step further. “When [the chandeliers] came here they were in really rough shape,” said Gregory Leifel, executive director of the Sanfilippo Foundation. Sanfilippo was so taken by the chandeliers that he started a new company to produce replicas of them. But that new venture was mostly for his own benefit. Sanfilippo had agreed to return the original chandeliers to the Uptown if the theater were ever restored. And the nut magnate created exact reproductions just in case. The Pearlman & Co. chandeliers and are considered among the finest the company ever designed. The largest of those fixtures is 14 feet tall. It graced the Uptown’s elegant lobby and now hangs in the foyer of what’s called the Place de la Musique at the Sanfillipo estate. The estate’s auditorium houses some of the other chandeliers while the Uptown’s large wall sconces line its stairwells. Last year it was announced that $75 million in financing had been secured for the Uptown’s restoration. The extensive, massive project includes bringing back the original chandeliers that for nearly 20 years have been at the Sanfilippo estate. The Sanfilippo estate also has other Uptown fixtures and assorted parts in storage that the theater’s restorers will likely use to recreate some artifacts that have been forever lost. Mangel is now the chief curator of the Wannamaker Organ at Macy’s in Philadelphia and says he expects to return to Chicago to help with that restoration. “I did an awful lot of research about how we are going to make these things no one’s done for 75 years,” said Mangel. The Uptown’s restoration project is expected to begin this August and be completed by 2021. The reinstallation of the chandeliers will likely be one of the last things done. And it will be a triumphal return. The Sanfilippo estate occasionally opens its doors to the public. Learn about public tours here.